The philosophy of pathei-mathos is based on four axioms: (i) that it is empathy and pathei-mathos which can wordlessly reveal the ontological reality both of our own physis  and of how we, as sentient beings, relate to other living beings and to Being itself; (ii) that it is denotatum  – and thus the abstractions deriving therefrom  – which, in respect of human beings, can and often do obscure our physis and our relation to other living beings and to Being; (iii) that denotatum and abstractions imply a dialectic of contradictory opposites and thus for we human beings a separation-of-otherness; and (iv) that this dialectic of opposites is, has been, and can be a cause of suffering for both ourselves, as sentient beings, and – as a causal human presenced effect – for the other life with which we share the planet named in English as Earth. In essence, empathy and pathei-mathos lead us away from the abstractions we have constructed and manufactured and which abstractions we often tend to impose, or project, upon other human beings, upon ourselves, often in the belief that such abstractions can aid our understanding of others and of ourselves, with a feature of all abstractions being inclusion and exclusion; that is, certain individuals are considered as belonging to or as defined by a particular category while others are not. Over millennia we have manufactured certain abstractions and their assumed opposites and classified many of them according to particular moral standards so that a particular abstraction is considered good and/or beneficial and/or as necessary and/or as healthy, while its assumed dialectical opposite is considered bad (or evil), or unnecessary, or unhealthy, and/or as unwarranted. 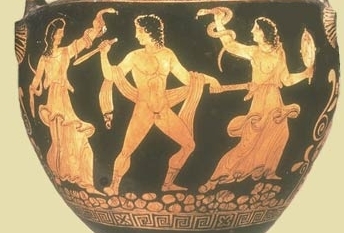 Thus in ancient Greece and Rome slavery was accepted by the majority, and considered by the ruling elite as natural and necessary, with human beings assigned to or included in the category ‘slave’ a commodity who could be traded with slaves regarded as necessary to the functioning of society. Over centuries, with the evolution of religions such as Christianity and with the development in Western societies of humanist weltanschauungen, the moral values of this particular abstraction, this particular category to which certain human beings assigned, changed such that for perhaps a majority slavery came to be regarded as morally repugnant. Similarly in respect of the abstraction designated in modern times by such terms as “the rôle of women in society” which rôle for millennia in the West was defined according to various masculous criteria – deriving from a ruling and an accepted patriarchy – but which rôle in the past century in Western societies has gradually been redefined. Yet irrespective of such developments, such changes associated with certain abstractions, the abstractions themselves and the dialectic of moral opposites associated with them remain because, for perhaps a majority, abstractions and ipseity, as a criteria of judgment and/or as a human instinct, remain; as evident in the continuing violence against, the killing of, and the manipulation, of women by men, and in what has become described by terms such as “modern slavery” and “human trafficking”. In addition, we human beings have continued to manufacture abstractions and continue to assign individuals to them, a useful example being the abstraction denoted by the terms The State and The Nation-State  and which abstraction, with its government, its supra-personal authority, its laws, its economy, and its inclusion/exclusion (citizenship or lack of it) has come to dominate and influence the life of the majority of people in the West. Ontologically, abstractions – ancient and modern – usurp our connexion to Being and to other living beings so that instead of using wordless empathy and pathei-mathos as a guide to Reality  we tend to define ourselves or are defined by others according to an abstraction or according to various abstractions. In the matter of the abstraction that is The State there is a tendency to define or to try to understand our relation to Reality by for example whether we belong, are a citizen of a particular State; by whether or not we have an acceptable standard of living because of the opportunities and employment and/or the assistance afforded by the economy and the policies of the State; by whether or not we agree or disagree with the policies of the government in power, and often by whether or not we have transgressed some State-made law or laws. Similarly, in the matter of belief in a revealed religion such as Christianity or Islam we tend to define or understand our relation to Reality by means of such an abstraction: that is, according to the revelation (or a particular interpretation of it) and its eschatology, and thus by how the promise of Heaven/Jannah may be personally obtained. This uncovering, such a revealing, is of a knowing beyond ipseity and thus beyond the separation-of-otherness which denotatum, abstractions, and a dialectic of opposites manufacture and presence. A knowing of ourselves as an affective connexion  to other living beings and to Being itself, with Being revealed as fluxive (as a meson – μέσον  – with the potentiality to change, to develope) and thus which (i) is not – as in the theology of revealed religions such as Christianity and Islam – a God who is Eternal, Unchanging, Omnipotent , and (ii) is affected or can be affected (in terms of physis) by what we do or do not do. In terms of understanding Being and the divine, it inclines us or can incline us, as sentient beings, to apprehend Being as not only presenced in us but as capable of changing – unfolding, evolving – in a manner dependant on our physis and on how our physis is presenced by us, and by others, in the future. Which seems to imply a new ontology and one distinct from past and current theologies with their anthropomorphic θεὸς (god) and θεοὶ (gods). 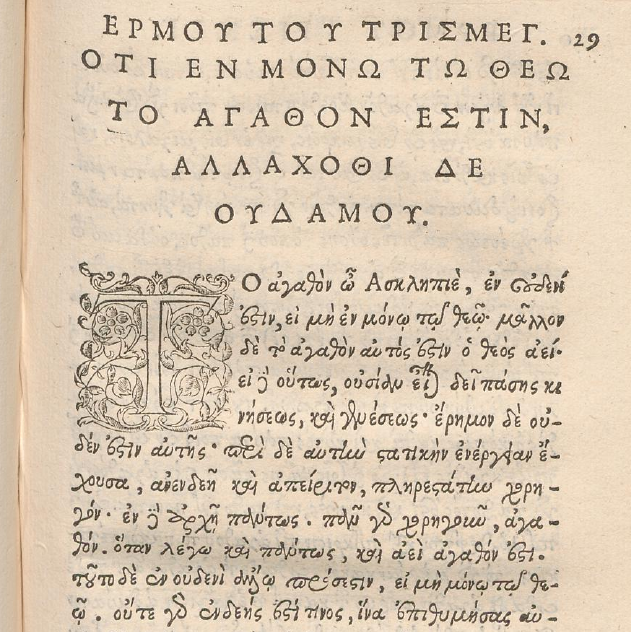 With καλὸς κἀγαθός, such personal conduct, and such a new civitas, summarising how the philosophy of pathei-mathos might, in one way, be presenced in a practical manner in the world. I use the term physis – φύσις – ontologically, in the Aristotelian sense, to refer to the ‘natural’ and the fluxive being (nature) of a being, which nature is often manifest, in we mortals, in our character (persona) and in our deeds. Qv. my essay Towards Understanding Physis (2015) and my translation of and commentary on the Poemandres tractate in Corpus Hermeticum: Eight Tractates (2017). As noted elsewhere, I use the term denotatum – from the Latin denotare – not only as meaning “to denote or to describe by an expression or a word; to name some-thing; to refer that which is so named or so denoted,” but also as an Anglicized term implying, depending on context, singular or plural instances. As an Anglicized term there is generally no need to use the inflected plural denotata. In the context of the philosophy of pathei-mathos the term abstraction signifies a particular named and defined category or form (ἰδέᾳ, εἶδος) and which category or form is a manufactured generalization, a hypothesis, a posited thing, an assumption or assumptions about, an extrapolation of or from some-thing, or some assumed or extrapolated ideal ‘form’ of some-thing. In respect of denotatum, in Kratylus 389d Plato has Socrates talk about ‘true, ideal’ naming (denotatum) – βλέποντα πρὸς αὐτὸ ἐκεῖνο ὃ ἔστιν ὄνομα, qv. my essay Personal Reflexions On Some Metaphysical Questions, 2015. Personal Reflexions On Some Metaphysical Questions. Contrary to modern convention I tend to write The State instead of “the state” because I consider The State/The Nation-State a particular abstraction; as an existent, an entity, which has been manufactured, by human beings, and which entity, like many such manufactured ‘things’, has been, in its design and function, changed and which can still be changed, and which has associated with it a presumption of a supra-personal (and often moral) authority. In addition, written The State (or the State) it suggests some-thing which endures or which may endure beyond the limited lifespan of a mortal human being. Given the foregoing, then principally – and to be exact – physis denotes the quidditas of beings having changement inherent within them; for substantia has been denoted by physis because it embodies this, as have the becoming that is a coming-into-being, and a burgeoning, because they are changements predicated on it. For physis is inherent changement either manifesting the potentiality of a being or as what a being, complete of itself, is. That is, as I noted in my essay Towards Understanding Physis, it is a meson (μέσον) balanced between the being that-it-was and the being it has the potentiality to unfold to become. Qv. Towards Understanding Physis, 2015. Qv. footnote . In terms of ontology a meson is the balance, the median, existing between the being which-was and the being which-can-be. This understanding of Being as fluxive – as a changement – was prefigured in the mythos of Ancient Greece with the supreme deity – the chief of the gods – capable of being overthrown and replaced, as Zeus overthrew Kronos and as Kronos himself overthrew his own father. κόσμον δὲ θείου σώματος κατέπεμψε τὸν ἄνθρωπον, “a cosmos of the divine body sent down as human beings.” Tractate IV:2, Corpus Hermeticum. Quomodo per inferiora superioribus exposita deducantur superiora, et per mundanas materias mundana potissimum dona. How, when what is lower is touched by what is higher, the higher is cosmically presenced therein and thus gifted because cosmically aligned. Which is a philosophical restatement of the phrase “quod est inferius est sicut quod est superius” (what is above is as what is below) from the Latin version, published in 1541 CE, of the medieval Hermetic text known as Tabula Smaragdina. The quotation is from my Classical Paganism And The Christian Ethos, 2017. The quotation is from my Tu Es Diaboli Ianua: Christianity, The Johannine Weltanschauung, And Presencing The Numinous, 2017.
according to the terms of that license. Reared as a Roman Catholic, educated for a while at a Catholic preparatory school and then – again for a while – at a Catholic boarding school, I remember the history taught by our teachers and Priests of the centuries-long persecution of English and Irish Catholics that began in the 16th century. There were stories of martyrs; of recusants; of secret Masses; of anti-Catholic polemics and propaganda; and of the monks who – after the suppression of the monasteries, the theft of monastic lands and wealth, begun by a tyrannos named Henry – escaped to France and founded monasteries such as the one at Dieulouard in Lorraine. This feeling of difference was forcefully remembered when I in the early 1970’s – during The Troubles – ventured to visit Northern Ireland; when I in the mid-1970’s and as a Catholic monk spent several weeks staying at a Presbytery in Dublin; and when I in the mid-1990’s – before the Good Friday Agreement – visited Derry. Forcefully remembered because I listened to accounts of the burning of Catholic homes by Protestant mobs in 1969 and the subsequent flight of hundreds of Catholic families to the Irish Republic where they were housed in refugee camps; listened to witness accounts of the killing of eleven Catholics, including a Priest, by the British Army in Ballymurphy in 1971; listened to witness accounts of the killing of fourteen Catholics, again by the British Army, in Derry in 1972; and listened to stories of the persecution of Irish Catholics under British rule. Such a remembering, such a childhood feeling of difference, formed part of the years-long personal and philosophical reflexion that occupied me for several years as I, between 2006 and 2009, developed my ‘numinous way’ and then between 2011 and 2012 gradually refined it into the ‘way of pathei-mathos’, with the core of that reflexion concerning matters such as extremism, my own extremist past, war, prejudice, intolerance, and persecution. Which led me to consider making a distinction between war and a more personal combat, between a modern krieg and the Old Germanic werra, given that war, from my reading of and admittedly fallible understanding of history, seemed to me to involve – by its very nature of necessitating killing and causing injury – intolerance, hatred, a divisive sense of difference often involving “us” believing we were “better” (or more civilized) than them, our enemies, thus leading to a dehumanization of “the enemy”. A divisive sense of difference and a dehumanization often aided (particularly in modern times) by polemics, rumour, and propaganda; and a divisive sense of difference, a dehumanization, together with polemics, rumour, and propaganda, which I knew from my own decades of political and religious activism formed a core part of all types of extremism. The distinction I considered was that personal combat unlike war did not involve large armies fighting against each other because of some diktat or personal agenda by some tyrannos or because of some ideology or religion or policy of some State or government. Instead, combat involved small groups – such as clans or tribes or neighbours – fighting because of some personal quarrel or some wrong or some perceived grievance. But the more I considered this supposed distinction between combat and war the more I realized that in practice there was no such distinction since both involved principles similar to those of the Ancient Roman Leges Regiae – qv. the Jus Papirianum attributed to Sextus Papirius – where someone or some many possess or have acquired (through for example force of arms) or have assumed authority over others, and who by the use of violence and/or by the threat of punishment and/or by oratory or propaganda, are able to force or persuade others to accept such authority and obey the commands of such authority. Which hierarchy and acceptance of authority led Augustine to describe – in book XXII of Contra Faustum Manichaeum – the concept that war requires the authority of a person (such as a monarch) who has such “necessary” authority over others. This concept regarding war has remained a guiding principle of modern Western nations where the authority to inaugurate and prosecute a war against perceived enemies resides in the State, and thus in modern potentates who have seized power or in elected governments and their representatives such as Presidents and Prime Ministers. In practical terms this means trying to cultivate within ourselves the virtues mentioned by Cicero – self-restraint, dignity, fairness, honesty – and implies we have no concern for or we seek to cultivate no concern for supra-personal hierarchies and supra-personal authority – whether political, religious, or otherwise – and thus move away from, try to distance ourselves from, the consequences of such supra-personal hierarchies and supra-personal authority manifest as the consequences are and have been, throughout our history, in war, prejudice, intolerance, unfairness, extremism, and persecution in the name of some ideology, some religion, or because someone has commanded us to persecute those that they and others have declared are “our” enemies, and which war and persecutions are often, especially in modern times, accompanied by propaganda and lies. Thus in the case of my Catholic remembering, those soldiers in Ballymurphy and in Derry shot and killed civilians, women included, because those soldiers believed them to be “enemies”, because propaganda had dehumanized those enemies; because those soldiers were part of and obeyed a hierarchical, supra-personal, chain-of-command by being there armed and prepared to use deadly force and violence against individuals they did not personally know; and because in the aftermath of those killings, and for years afterwards, they were not honest and hence did not contradict the propaganda stories, the lies, about those events which some of their superiors and others circulated in an attempt to justify such acts of inhumanity. Yet for me the real tragedy is that events similar to those of my very personal remembering have occurred on a vaster scale millennia after millennia and are still occurring, again on a vaster scale and world-wide, despite us having access to the wisdom of the past, manifest as such wisdom is, for those reared in the West, in the Agamemnon of Aeschylus, in the Oedipus Tyrannus of Sophocles, in the mythos of Μοῖραι τρίμορφοι μνήμονές τ᾽ Ἐρινύες , in many of the writings of Cicero, in Τὰ εἰς ἑαυτόν by Marcus Aurelius, in the numinous beauty of Gregorian chant, in the music of JS Bach, and in so many, many, other writers and artists ancient and modern. M. Tullius Cicero, Pro Murena Oratio, 23. My translation. By ‘society’ in the context of this essay and the way of pathei-mathos is meant a collection of individuals who dwell, who live, in a particular area and who are subject to the same laws and the same institutions of authority. Modern society is thus a manifestation of some State, and States are predicated on individuals actively or passively accepting some supra-personal authority, be it governmental (national) or regional (county), or more usually both. In De Finibus Bonorum et Malorum Marcus Tullius Cicero, in criticizing Epicurus and others, presents his view of Summum Bonum, a term normally translated as ‘the supreme good’. According to Cicero, honestum (honourable conduct) is the foundation of Summum Bonum which itself can be discerned by careful consideration (ratio) in conjunction with that knowing (scientia) of what is divine and what is mortal that has been described as wisdom (sapientia). He then writes that honestum does not depend on any personal benefit (omni utilitate) that may result or be expected but instead can be discerned by means of consensus among the whole community in combination with the example afforded by the honourable actions and motives of the finest of individuals. In effect, Summum Bonum – what the Greeks termed τὸ ἀγαθὸν – depends on certain personal qualities such as a careful consideration of a matter; on a personal knowing of what is divine and what is mortal; on the example of personal noble deeds and motives, and on a communal consensus. There is therefore nothing morally abstract or dogmatic about Cicero’s understanding of Summum Bonum which so well expresses, as does Seneca , the Greco-Roman view, with a perhaps more apt translation of the term Summum Bonum thus being “the highest nobility”. An extract from the Introduction to my forthcoming translation of and commentary on the sixth tractate of the Corpus Hermeticum, entitled as that tractate is ῞Οτι ἐν μόνῳ θεῷ τὸ ἀγαθόν ἐστιν ἀλλαχόθι δὲ οὐδαμοῦ: That In The Theos Alone Is Nobility And Not Anywhere Else. For the past few weeks I have been re-reading classical authors such as Thucydides, Herodotus, Pliny, and Tacitus. Which reading led to me to reflect upon the histories of the nations of the modern West and the form of government – the modern democracy – that they have developed and whether such problems as I, personally, perceive that such a form of government has may be detrimental to Western societies in the future. 1. The first problem I perceive with modern democracy is that a country generally gets the leaders – presidents, prime ministers – and the government who and which tend to reflect, in their words, promises, and policies, the often changeable fears, hopes, and emotions of a majority of people at election time or at least of the percentage necessary to win an election; with such fears, hopes, and emotions often engendered by the Media, by a specific political party, by a ‘social movement’, and by ‘special interest’ (advocacy) groups or individuals with their own agendas, all of whom seek to influence ‘public opinion’ and the policies of politicians and governments. Such ‘special interest’ groups invariably include those with particular business and political concerns who have the financial resources to employ professional lobbyists, Media consultants, and propagandists. The result is that the political party and/or particular advocacy groups who have the most money during elections campaigns, and who have the support of a substantial part of the Media, and/or who have a candidate for high office who is a persuasive public speaker, influence the result of elections, having persuaded or influenced the percentage of people necessary to win an election. In other words, modern elections have become an often cynical process of targeting, persuading, and influencing, people (or specific types of people) by appealing to their fears, their hopes, their emotions, based on specific – and supra-personal – political, social, and business, agendas and interests. In practical terms this means that the leaders tend to represent their own personal (sometimes emotive) and/or political agenda and/or the agendas of whatever ‘special interest’ groups have helped them get elected. Naturally they deny this, since they invariably and cynically declare that their policies and actions represent “the will of the people” – and thus that they have a mandate for those policies and actions – or they rather naively do believe that they have a mandate having a personality or the personal vanity which has made them a mere figurehead for ‘special interest’ groups and/or the political magnates of their own political party who themselves have their own agendas. Over decades, the cynical process of targeting, persuading, and influencing, people results in changing governments, for with each new election a majority of people are persuaded or believe that “it will be better, different, next time” and that their hopes will be realized by electing a different president or a different political party or even by electing the same political party but with a different prime minister and some different politicians. Meanwhile, very little of substance changes for the majority. There may be some cosmetic changes, but public services often get worse, crime increases, with the poor staying poor, and the rich staying rich or becoming richer, immune or indifferent as the majority of the rich are to declining public services, to social problems, and to increasing crime. 2. The second problem with modern democracy is that politicians in general and candidates for leadership positions in government do not have to have – and in these modern times are not expected by the public to have – practical character-revealing life-experiences; and thus to have undertaken deeds which have revealed that they are courageous individuals who in dangerous or difficult situations have placed the life of others and of their country before their own. Life-experience such as serving in the armed forces of one’s country and being awarded a medal or medals for gallantry; or serving as a ‘first responder’ – such as a paramedic, or a police officer, or in the Fire & Rescue service – and thus having faced difficult, trying, and life-threatening circumstances. Instead, all individuals have to do to qualify as a politician is to have powerful and influential friends, and/or have the support of a substantial part of the Media, and/or have the support of influential advocacy groups, and/or have adroitly played ‘the political game’ and thus have been selected by the political magnates of their own political party, and/or have personal wealth sufficient to buy their way into the Media or – through (sometimes secret) donations or other means – gain the support of influential advocacy groups. The result is that in a modern democracy there is a leader, and a government composed of a majority of politicians, who have no courageous deeds to their name, who have no experience of ‘front line’ service to their country and to their people, but who send people to fight wars, who make and enforce policy for the ‘front line’ services of their own land, and who can and who do, and based on some supra-personal political agenda, impose sanctions on other countries and who thus cause suffering to the ordinary people of those other countries. In other words, you have career politicians who have never proved their mettle – never been tested – in dangerous or difficult situations lauding it over those who have. 3. The third problem with modern democracy is that modern politicians – with only a few exceptions – have mastered and use the art of propaganda, evident in their inability to be open and honest about their own failings and culpability while in public office, and in their inability to be honest about the failure of the policies of their government. Instead, they are adroit at manufacturing excuses, or shifting the blame away from themselves and government policies, or are disingenuous when answering questions or when addressing concerns about their culpability or that of their government. 4. The fourth problem with modern democracy is that, as a consequence of the aforementioned three problems, there is not “government by the people for the people” but instead government by a generally self-serving or advocacy-driven clique. Which political clique is generally wealthier – for politicians are paid well and often have other sources of income – than the majority of the electorate they were elected to serve. Since modern democracy is today still considered by the majority to function reasonably well in terms of maintaining society, it will remain for that majority the only viable option. For its inherent cynical process of targeting, persuading, and influencing, people will work so long as a majority can be persuaded that, after the next election, “it will be better, different,” with the self-serving or advocacy-driven political clique well-understanding the Psychologie des Foules. Thus, the always well-off political clique will continue to laud it over the poor and those whose ‘front-line’ public service keeps society functioning. The self-perpetuating political clique will continue to makes excuses for their own failures, for declining public services, for government failure to solve social problems, and for increasing poverty, homelessness, and crime. Mass discontent, as for example in the anti-war protests before and after the invasion of Iraq, strikes, scandals about corrupt politicians, even occasional riots, have not impacted significantly on the self-perpetuating political cliques: a change of leadership, some new policies, the dismissal or the resignation of a few politicians, propaganda by the Media, perhaps the election of a new government, are usually all that is required to maintain the democratic ‘status quo’. A study of history, ancient and modern, indicates – at least to me – that such manipulation of the many by the few for the benefit of the few cannot, given human nature en masse, continue indefinitely. That there may well arise such a breakdown of basic services, such perceived inequality, such perceived injustices, such widespread discontent, that revolution, somewhere – peaceful or otherwise – seems almost inevitable, with the attendant suffering that revolutions often cause. Thus will the cyclical nature of human history repeat itself, for we humans apparently have not changed, en masse, significantly enough so that we are personally guided by such virtues as honesty, reason, and εὐταξία to thus be immune to the propagandistic machinations of politicians, demagogues, ideologues, and special interest groups. Instead, it seems that the same fears, hopes, and emotions, still guide us, just as the negative traits of old seem to still guide so many of those few who have, by whatever means, acquired power and authority over the majority. Can this apparently inevitable suffering-causing cyclicity – such as that of governing cliques and their overthrow, and of the decline of societies – be avoided? My own personal – and admittedly fallible – answer is to reform modern democracy so that leaders and politicians must have such personal character-revealing experience as qualifies them to lead and to govern, with that personal experience consisting of proven and years-long ‘front line’ service to their country and to their people such as in the armed forces or serving as a ‘first responder’ in such occupations as paramedic, a police officer, and in the Fire & Rescue service. However, such a reform by having character-revealing experience as a qualification for political office is unlikely to occur, given vested interests and – dare I say it – an education system which has neglected study in their original language of authors such as Thucydides, Herodotus, Aeschylus, Sophocles, Aristotle, Pliny, Tacitus, and Cicero. For this seems to me to capture something of our rather strange human nature – of our ability, our potential, our capacity, to be honourable, self-restrained, rational human beings, and our seemingly equal capacity (or often, greater capacity) to be unsympathetic, insensitive, selfish, dishonourable, untrustworthy, or just plain barbaric.